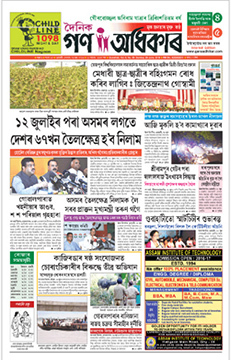 Dainik Gana Adhikar (Assamese: গণ অধিকাৰ) is an Assamese daily newspaper owned by Unity Media & Infrastructure Limited, and has its headquarters in Guwahati. In 1994, the media organization started with Gana Adhikar as a weekly newspaper. Later, Dainik Gana Adhikar was launched as a daily. Zakir Hussain is Editor-in-Chief of the newspaper. The media group launched Dainik Gana Adhikar Epaper in April 2011. The newspaper claims to be the mouthpiece of common people to fight for their rights and justice.